Join our 671,057 members today and let’s make wealth happen. Designed for members looking to easily start investing or diversify their existing investment portfolio. Learn more about capped fees*. How is your fund performing? Find out if you are paying high fees for underwhelming performance. Whether you’re saving for a house, holiday or rainy day, we’ll help you find the right term deposit for your needs. 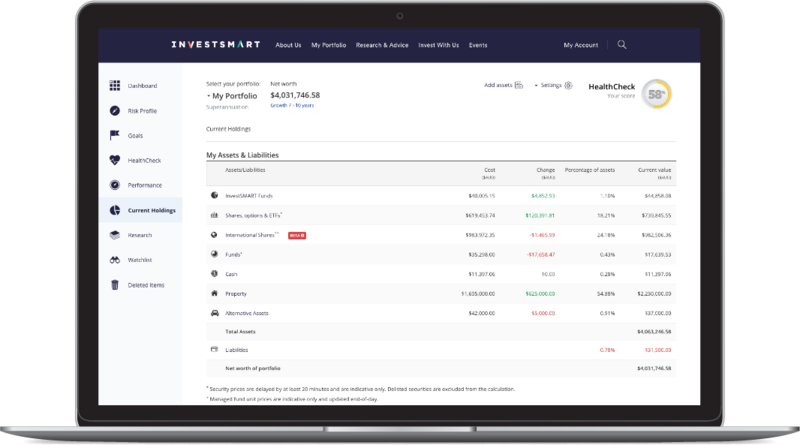 A simple way to monitor your investments in one easy place. # InvestSMART Portfolio figures shown since each respective Inception Date as indicated in the graph; after investment and admin fees excl. brokerage, excluding franking; dividends re-invested, no withdrawals have been made. The peer comparison figures have been sourced from Morningstar data and is therefore limited to the funds and investment products included in their database. This may not include all funds available for retail investment in Australia. The peer calculation is inclusive of admin and investment fees; excludes brokerage and no withdrawals have been made. InvestSMART cannot determine whether or not franking has been included, nor if dividends have been reinvested. Historical performance is not a reliable indicator of future performance.